The Palomino Kum Long Point pencil sharpener has a hinged plastic lid, and after you open and close it a few hundred times, the damn thing breaks off. A rubber band is the obvious solution. An Amazon reviewer even suggests this. But none of the reviewers mention how disgusting the rubber band gets. 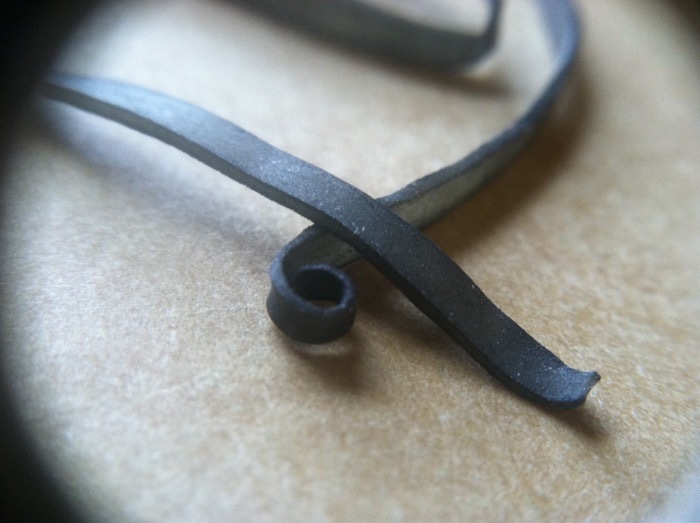 After a year or so working with graphite, your rubber band will go from tan, to grey, to black. And something about graphite on rubber gives it a limp, grimy feel, like a sick worm. But the thing keeps the lid on–still does its job, so you leave it on there, until you’re sharpening a pencil one Tuesday afternoon and you think to yourself, Someday, this will break. And, five seconds later, it does. How do you pay tribute to something so small? Something that worked so hard? Thanks for calling attention to small things of which I easily take advantage. I will now be more thoughtful on their disposal. Well done! I think you just did!